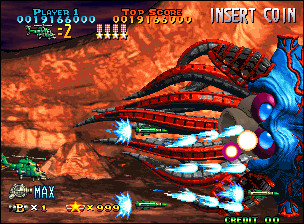 Here's another game that was only released for the MVS that would have largely deserved to exist on the AES. 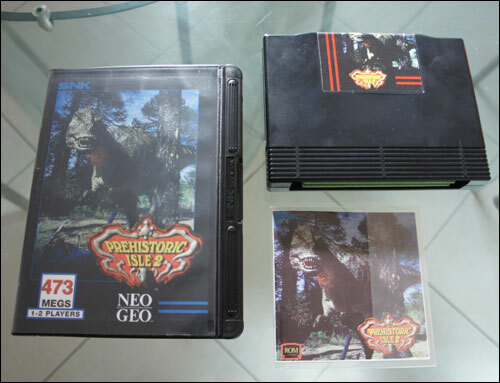 In the end, fortunately, God invented the convert, and all us Neo Geo fevers were saved of these losses. 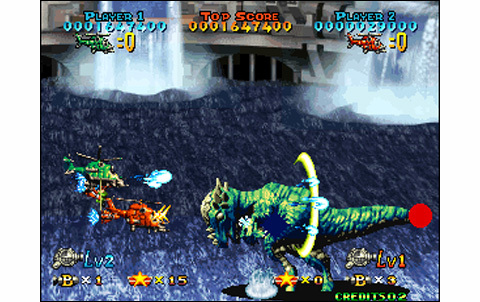 Impressive with its large size (478 Mb), this Prehistoric Isle 2 has many things to tickle shoot 'em up fans. 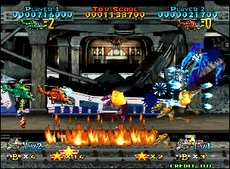 Directed by Yumekobo, the virtuosos programmers who gave birth to Blazing Star one year before, the game was born with quite a pedigree. 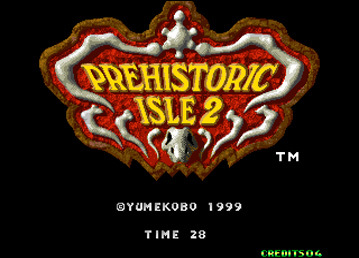 It's also the sequel of an excellent title released in 1989 by SNK: Prehistoric Isle, first of the name. 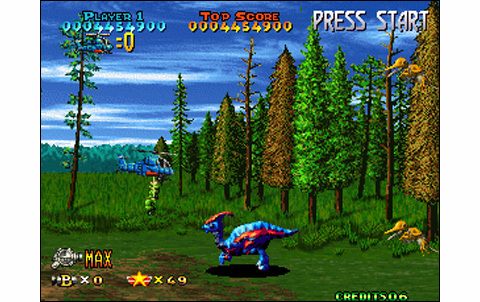 If the fact of killing dinosaurs rather than ships or aircraft may appeal some cruel gamers, we can not deny that the concept is original. And charm of this strange soft is also made by its 'kitsch' atmosphere, kind of UFO in the genre, advocating animal cruelty in the name of saving Earth. 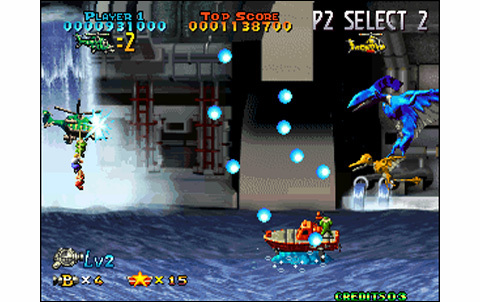 Playable two simultaneously, PI2 is part of those games that provide rare gaming pleasure, as we shall see. The realization is remarkable in every way, so much we feel that the programmers have alsmot fully mastered the machine capabilities. 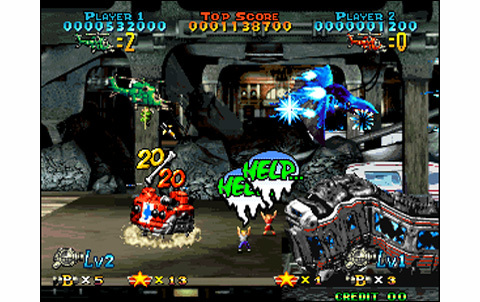 The graphics are a successful mix of pixel art and computer graphics digitizing. The nuances are well chosen, ranging from the aspect of water and reflections, the textures of the rocks, or the appearance of buildings and vegetation. Everything is sublime, with a color palette used with great talent. Animation is one of the smoothest I have ever seen in this kind of game. 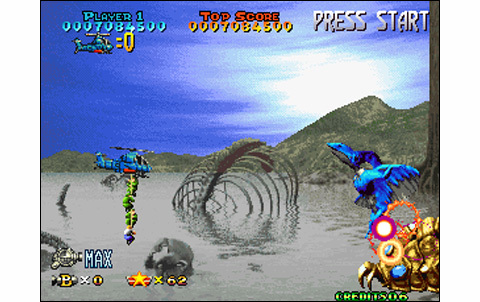 The helicopters move with fluidity and precision, and the enemies, 3-d animated transposed in 2-d, move in a surrealist way as they're smooth and fast. 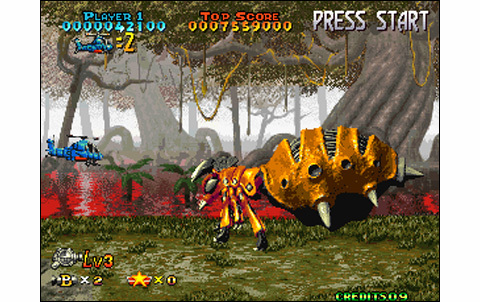 The Bosses of the game are varied, most of them are massive and perfectly animated, a real delight to see. 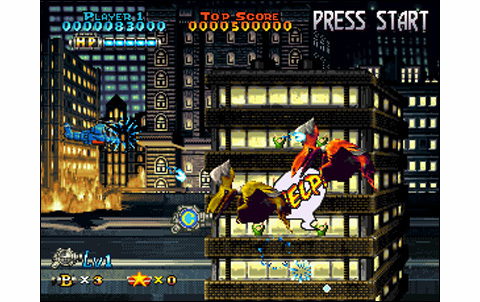 Besides, the backgrounds are alive and programmers have even integrated some impressive 3D effects. 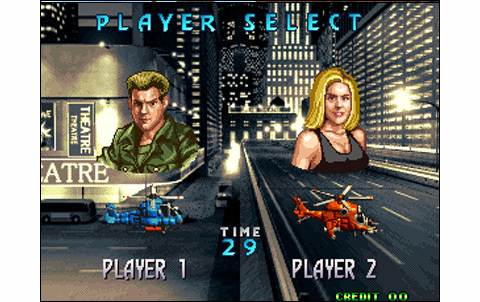 The soundtrack on the other hand, is downright fabulous. The melodies, sometimes dramatic, sometimes epic, yet complete this special atmosphere that sweat of the game. You feel like watching a fantasy movie - giant monsters ones - from the sixties! The japanese set, way more interesting in my opinion, offers a life bar with a maximum of six units, that is to say you can be hit five times before dying. 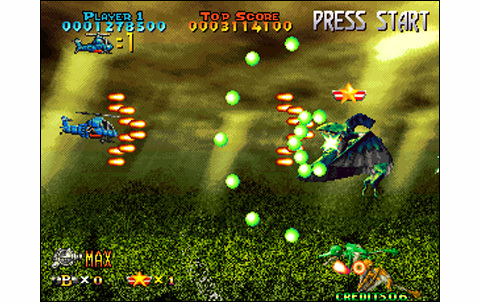 The funniest challenge, after some consideration, is to play with this version, without any credit. 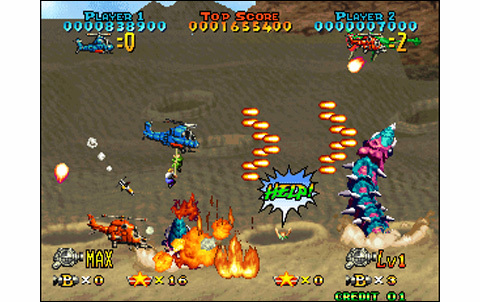 Big challenge for sure, but still largely achievable, especially since you can regain life units during the missions. 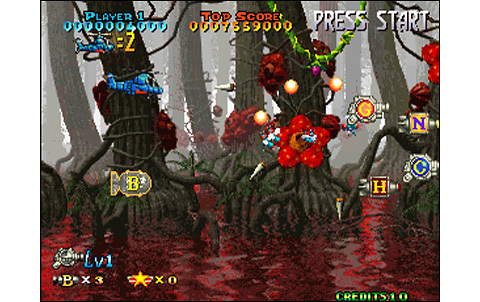 With its relatively accessible difficulty, the game is not super long, and it's a recurring feeling when the games are good! It takes approximately thirty-five minutes to clear it in a single row. 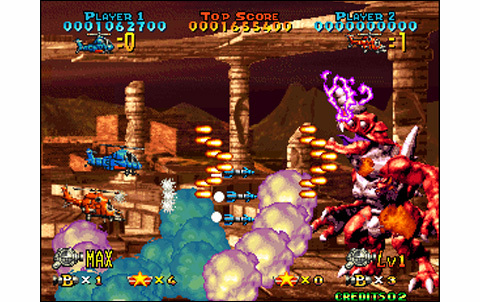 Like its big brother Blazing Star, even after having finished the game several times, you still come back willingly. 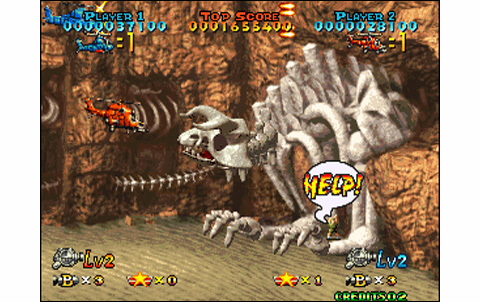 The game is punctuated by human rescues, and each stage is a challenge: indeed, you must save many people by retrieving them along your route, like in Metal Slug. 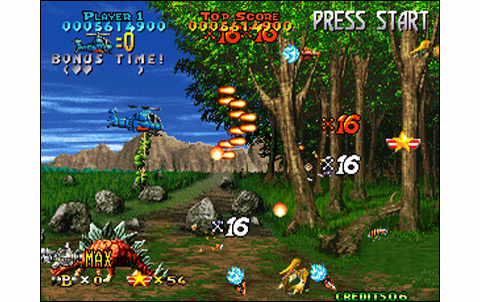 In addition, a combo point system makes the game more interesting for hi-scores! I think I've said enough to have you wanting to hunt down T-Rex. 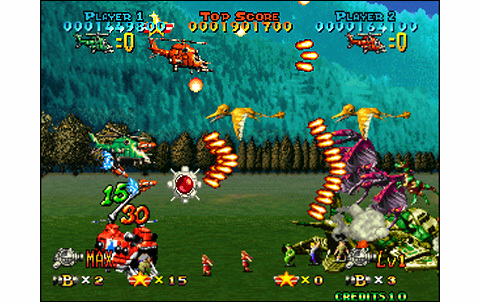 If you like shoot 'em up and are given the opportunity to acquire Prehistoric Isle 2, I have a word for you: go for it! Splendid, varied, colorful, perfectly chosen, we don't have enough adjectives to describe Pi2 graphics. Everything is greatly animated with and impressive smoothness. Even backgrounds are pretty alive. Dramatic themes et sounds embrace perfectly the game's tone, providing intense atmosphere! 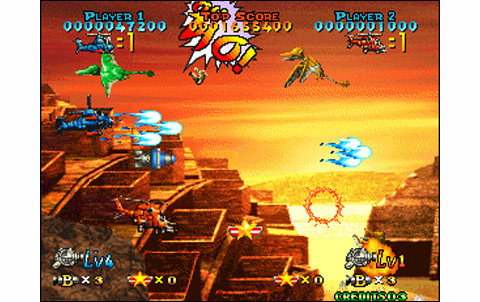 Sensibly as long as Blazing Star in a way easier version... but packing a golden Replay Value! Original, fun and taking. 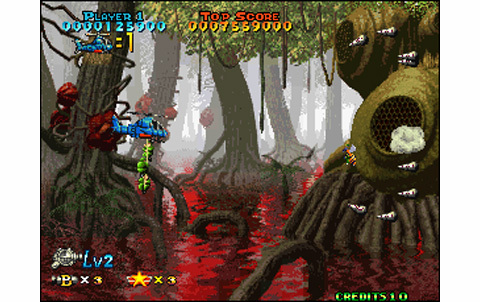 It's great to see dinos convulsing in giant blood spurts, to save hostages and make combo points! 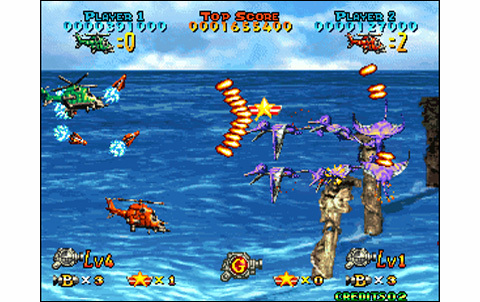 Fabulous realization and addictive gameplay, here is a little-known game that merits all your attention. One expensive conversion, often selling for 250 euros or more. If you wish to make a convert by yourself, you need the Pi2 MVS (about 60 euros), an AES Kof 98 (about 80 euros) and a good soldering iron. The game is a jewel and it'd be a shame not to have it.